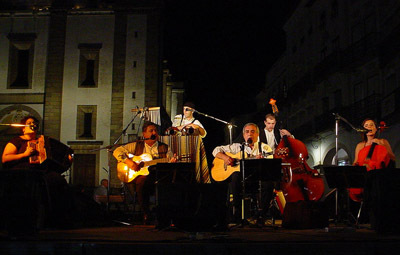 The show of Modas a Margem do Tempo (songs at the edge of time) presents several subjects of the traditional culture of Alentejo and confers to this music the arguments to listen the sung stories and other feelings, in a more universal and sophisticated format - traditional songs of Alentejo brought for the present times. "Vocally the group is supported by the two male-intonated voices - strong and intense. Two musicians who also are responsible for the acoustic guitars. A violoncello and especially the accordeon - in this case overcome by the women of this collective - guarantee the provocations which the music thanks. Ladies of "Modas", they lend also the voice to some moments. At the bottom, imaginative and discrete, The man of the percussion - sometimes hypnotic - divided by two earthenware jars, the rag of floorcloth, a rain club and other sources of sound, meeting with the double bass in the set of rates/rhythms which gives life to the music".
. Crise? Que crise ? !